Oliver Gerrish offers tailor-made tours with exclusive access to great country houses and the very British lifestyle. Oliver collaborates with art historian Zuleika Parkin, and Lady Caroline Percy, a leading interior decorator and specialist in historic interiors. For more information please go to www.thegreatbritishtour.com. HISTORIC DECORATION is a new and dynamic series on the history of British interior decoration from the Elizabethan era up until the 1960s. The days are hosted by Oliver Gerrish and Lady Caroline at Syon House. Speakers include many of the most admired names in British interior design and architectural history. In April 2018 Historic Decoration teamed up with LASSCO at Brunswick House to create Salon Wednesdays - a series of lectures with wine. We have been very fortunate to have had Edward Bulmer, Stephen Calloway and Jeremy Musson speaking for the first series. A Georgian footman awaits for the guests to arrive. Private dinner party at The Georgian Group, hosted by Oliver Gerrish as part of the tour. We have strong connections to many of the top boutique hotels throughout Britain and, depending on the size of the group, we will stay in those or in the houses themselves. We can cater for any guests from abroad with polite translators, who will accompany the tour. Caroline is an interior designer and consultant in Fine Art and Antiques. As well as designing interiors, she advises clients on the acquisition and sale of antiques, including furniture, objets d’art and paintings. Caroline grew up surrounded by historic and important works of art. This fostered an interest in the decorative arts and encouraged her to acquire a wide knowledge of historic interior styles. She has lived in Italy, France and Spain and speaks those languages fluently. Visits to museums and private collections around Europe increased her knowledge of continental art and interiors. While living abroad, she worked with Spanish antique dealers, sourcing antiques for export to Spain, thus building up a large network of wholesale antique specialists. On returning to live in England, she has continued to successfully source antiques and works of art for a wide international clientele. The interior design side of the business developed in response to clients’ requests to create interiors suitable for the period and style of their house or for their collections. Caroline has worked on a number of high profile design projects for both historic and modern Interiors and has appeared on various television programmes commenting on antiques and the interior design of historic houses. 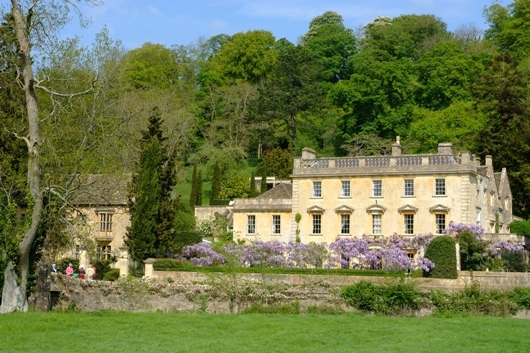 Iford Manor – one of England’s most beautiful manor houses and home to the private Cartwright collection of art and furniture. Tour conducted by owner William Cartwright-Hignett of the house and garden, which is the world famous work of Harold Peto. Afternoon tour of Bath, Englands finest Georgian city, to include; The Royal Crescent, Bath Abbey, The Roman Baths and The Pump Rooms. High Glanau Manor – one of Wales’s best examples of an Arts and Crafts house and garden. Created by the first Architectural Editor of Country Life Magazine, Henry Avray Tipping, the house was rescued by the Gerrish family. Helena Gerrish, author of the celebrated ‘Edwardian Country Life’ will lead the tour and host lunch. H.R.H the PRINCE OF wales came to high glanau as part of his annual summer tour to wales in 2015. Afternoon visit to Tintern Abbey. this great ruin helped to start the picturesque movement in British architecture. Chillington Hall – home to the Giffard family for nearly a thousand years. A masterpiece of Smith of Warwick and Sir John Soane. Home to Pompeo Batoni’s famous Giffard portraits, amongst other things. Charles giffard will conduct the tour. Afternoon visit to Weston Park, ancestral home of the Earls of Bradford. Curator Gareth Williams will conduct the tour. Tissington Hall – ancestral home of the Fitzherbert family and one of Derbyshire’s most picturesque stately homes. Sir Richard Fitzherbert will lead the tour. Afternoon visit to Renishaw Hall, home of Alexandra Sitwell. This house was the centre of the lives of England’s most famous twentieth century literary dynasty, the Sitwells. The house has fascinating associations with John Piper and the composer William Walton. Evening champagne and canapés followed by a private opera performance and dinner in the Great Hall. Boughton House – palace of the Dukes of Buccleuch and Queensberry and known as ‘The English Versailles’. This is one of the greatest treasure houses in Britain. Afternoon visit to private art and furniture dealer. Sign up to receive news and event invitations.